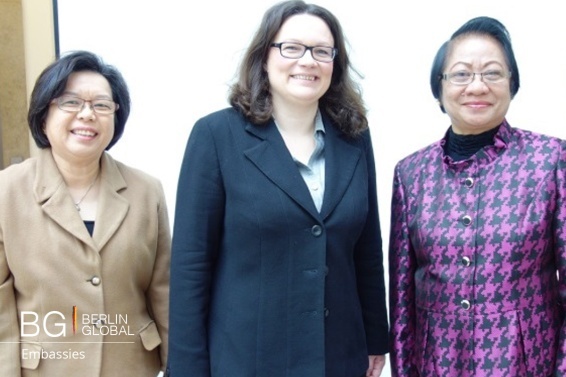 The visit of Secretary Rosalinda Dimapilis-Baldoz to Berlin and other German Cities was on the occasion of celebrating the third anniversary of the signing of the “Agreement Concerning the Placement of Filipino Health Care Professionals in Employment Positions in the Federal Republic of Germany,” also known as the Triple Win Project (TWP) in March 2013. The Secretary’s visit opened on a high note with a trip to the University Hospital Tübingen (UKT), one of the biggest employers of Filipino nurses under the TWP, with 21 Filipino nurses hired so far. The UKT administration led by Prof. Dr. Michael Bamberg, together with Philippine Honorary Consul General Prof. Gerhard Zeidler, organized a special program for Sec. Baldoz and her delegation, which included the Philippine Ambassador, H. E. Amb. Consul Cathy Torres and Vice Consul a.h. Cecile Krause. 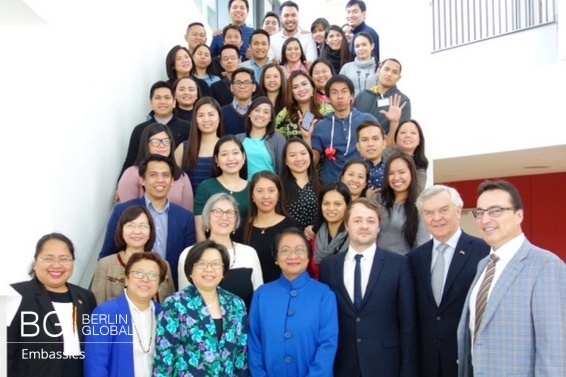 Thirteen other Filipino TWP nurses from Berlin, Freiburg, Munich, and Frankfurt travelled to Tübingen to join the activity with the help of the German Enterprise for International Cooperation (GIZ) and the coordination of the Philippine Embassy. Certificates of Recognition were given to those who have passed the German qualification examinations. In her remarks, Secretary Baldoz congratulated the nurses for what they have achieved; she challenged them to continue doing their best. “On your shoulders rests the responsibility, as the first batch of the TWP, to showcase the Filipino nurse,” she said. “Our best asset is still our human resources, and it is our country they see through you.” She conferred certificates to the nurses who had obtained their professional recognition from the German government. Consul General Gerhard Zeidler, a.h., labeled our nurses as Ambassadors of Goodwill for the program. “Through their model work ethics and values, you can convince other hospitals of the worth of Filipino nurses.” he said. The nurses delivered a presentation about their experiences from the time they were deployed to Germany, including the challenges they faced and how they were able to surmount them. They made special mention of UKT’s Director of Nursing Mrs. Sibylle Jerger for making them feel welcome in their new workplace and home. In Berlin, Parliamentary State Secretary Thorben Albrecht received Secretary Baldoz on for discussions after meeting Federal Minister for Labor and Social Affairs Andrea Nahles briefly. During their meeting, Secretary Baldoz highlighted the need for sustainability measures to ensure that the Philippines can help meet Germany’s need for qualified nurses in the long term. Mr. Albrecht recognized that Germany and the Philippines shared the same aspiration in terms of meeting their respective needs. Secretary Baldoz and State Secretary Albrecht agreed that apart from government agencies, the private sector would play an important role in implementing such sustainability measures.